Prominent & Leading Manufacturer from Mumbai, we offer rolimus 5mg, rolimus 10mg, tykerb tablets, votrient 400mg pazopanib tablets and bdenza 40mg. 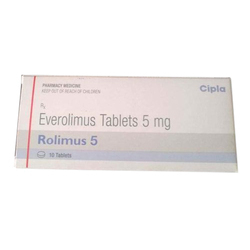 Rolimus 5mg Tablet is used in breast cancer, pancreatic cancer, lung cancer and kidney cancer. Rolimus 5mg Tablet suppresses the activity of body's immune system and prevents rejection of the transplanted organ. Take this medicine in the dose and duration as advised by your doctor. Swallow it as a whole. Do not chew, crush or break it. Rolimus 5mg Tablet may be taken with or without food, but it is better to take it at a fixed time. Rolimus 10mg Tablet is used in breast cancer, pancreatic cancer, lung cancer and kidney cancer. Rolimus 10mg Tablet suppresses the activity of body's immune system and prevents rejection of the transplanted organ. Take this medicine in the dose and duration as advised by your doctor. Swallow it as a whole. Do not chew, crush or break it. Rolimus 10mg Tablet may be taken with or without food, but it is better to take it at a fixed time. 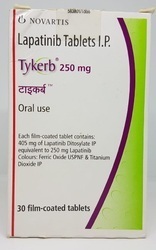 Lapatinib is used together with another medication (capecitabine) to treat a certain type of breast cancer (HER2-positive) that has not responded to the standard treatment. Lapatinib may also be used together with another medication (letrozole) to treat HER2-positive breast cancerin women after menopause. It works by slowing or stopping the growth of cancer cells. 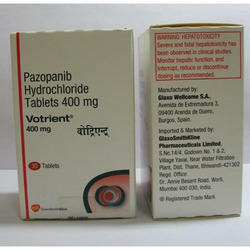 Pazopanib is used to treat kidney cancer. It may also be used to treat certain other types of cancer (soft tissue sarcoma). Pazopanib belongs to a class of drugs known as tyrosine kinase inhibitors. It works by decreasing the blood supply to the cancer tumor to slow tumor growth. This medication should not be used in children, especially younger than 2 years of age, because of the risk of serious side effects. Read the Medication Guide provided by your pharmacist before you start taking pazopanib and each time you get a refill. If you have any questions, ask your doctor or pharmacist. Take this medication by mouth without food as directed by your doctor, usually once daily. It is very important to take this medication on an empty stomach, at least 1 hour before or 2 hours after food. Swallow this medication whole. Do not crush, chew, or break the tablets. Doing so can release all of the drug at once, increasing the risk of side effects. 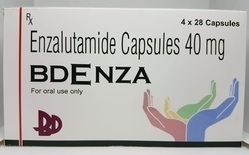 Enzalutamide is used in the treatment of prostate cancer. Enzalutamide is an antiandrogens. It works by blocking the effect of the natural male hormones on the growth of prostate cells.